Modern luxury meets grand Victorian Italianate style in the remarkable transformation of Moreton Manor, destined to become the most prized marquee home in the fashionable beachside haven of Bondi. 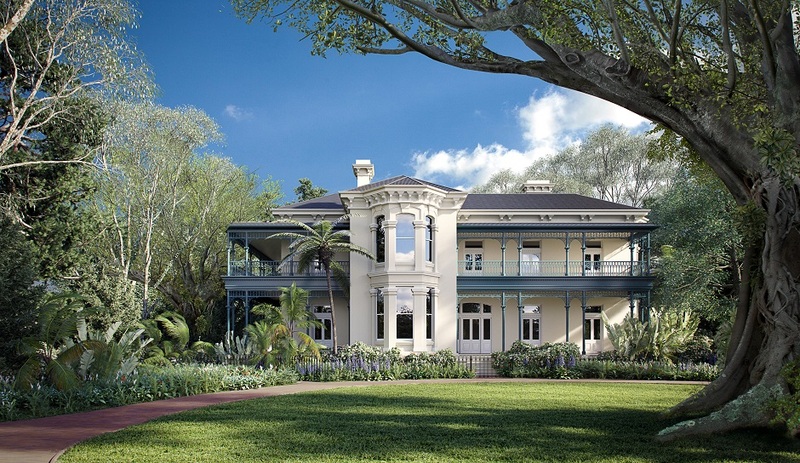 Moreton Manor is the heritage showpiece of The Moreton by Mirvac, and is being offered for sale with a redesign by two of Australia’s pre-eminent contemporary architects, Tina Engelen and Will Fung, of CO-AP Architects. Engelen and Fung have achieved an inspired fusion of old and new, breathing life into the original 1884 structure and creating a wing that introduces the essentials of contemporary living – north-facing double height living areas spilling to a cabana and swimming pool set in architecturally designed landscaped grounds. CO-AP’s impeccable style is evident, marrying a modernist’s sensibility with heritage sensitivity, taking advice from award winning heritage architect, Alan Croker of Design 5. The original home is clearly defined but merges seamlessly with the modern additions, the two bound together by a glass catwalk to form a united grand home. Underfoot, traditional timbers lead onto flamed stone floors, double height light-infused living spaces add an extra fillip of grandeur to already high ceilings and a bank of French doors open from the casual living area to an outdoor entertaining area and cabana, landscaped gardens and timber-hemmed infinity edge lap pool overlooking neighbouring Dickson Park. 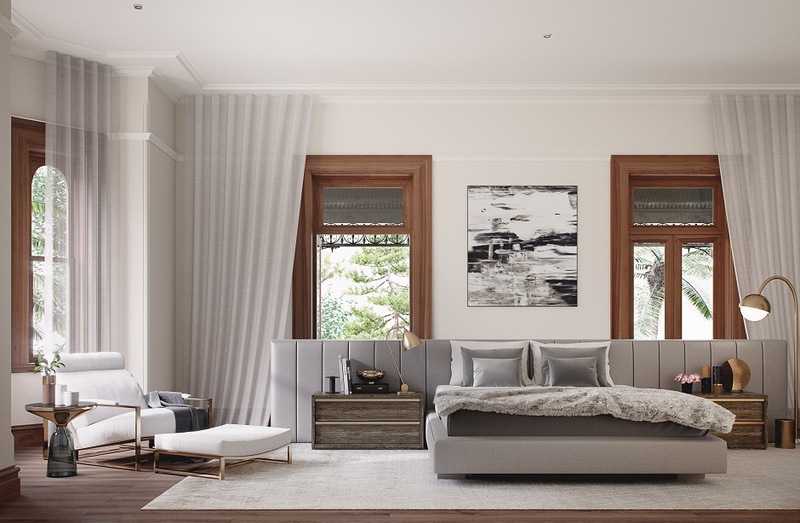 Contemporary materials complement the heritage palette of Australian hardwoods, painted masonry and cast iron lace work. The kitchen leaves no doubt about its luxury pedigree with a stunning use of contrasting black and white marble to form a sophisticated entertaining hub and preparation bench, complemented by an expansive butler’s pantry. Mirvac Development Director Paolo Razza said that saving Moreton Manor had been a priority from the moment the company acquired the site from the Benevolent Society in 2013. “This will be a landmark home that combines the best of old-world prestige and modern luxury,” said Mr Razza. “For thousands of Bondi locals, over many generations, it has been a much-loved fixture on Wellington Street and now we will restore it to what it was meant to be, in a way that respects its past but is uncompromising in its relevance to a contemporary lifestyle. Change and evolution have been a recurring theme in the history of the house. The original structure was a modest four room cottage built in 1858 and known as St Olives. By 1884 it had assumed much grander proportions with the cottage extended to become Scarba House, a Victorian Italianate mansion owned by Malcolm Campbell, a one-time mayor of Muswellbrook. Much of the original home remains completely intact, including decorative cornices and architraves, the grand cedar staircase and broad covered balconies. The redesign proposes a new pavilion within the footprint of the late Victorian rear kitchen wing with north-facing living areas opening to a pool set in landscaped grounds overlooking Dickson Park. The open plan space includes a kitchen featuring Gaggenau and Bora appliances and a sculptured marble island that is a natural gathering place for family and entertaining.